Have you ever seen more than 200 Pyrex Mixing Bowls in an antique store? Abbott Antiques in Sargent, Nebraska has many Pyrex Bowls on hand. Abbott sells Pyrex bowls in sets of 3, sets of 4 and as singles. 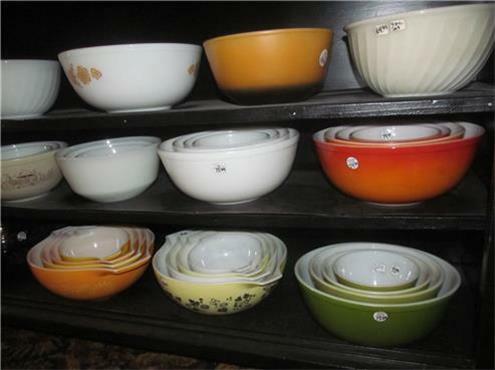 If you have broken or lost one of your Pyrex bowls Abbott may have your replacement bowl. Abbott has Fire King and other vintage mixing bowl sets on hand for all your baking needs! Remember Abbott is open every Saturday May 1 to November 1 for all Pyrex Collectors and other shoppers. November 2 to April 30 please call ahead before driving a distance to see Abbott’s large collection of Pyrex Bowls for sale.